The photos are not going to do this brussels sprouts gratin justice. But we’re going to flavor town today. If you make these creamy, cheese brussels (that also have crunchy pancetta, OF COURSE), and then attempt to take a photo? You’re out of luck. First, everyone is going to start eating it immediately because it will smell like pure heaven. Ridiculous. I mean, this smells SO delicious while it’s cooking. And second, brussels sprouts in creamy cheese sauce do not one attractive photo make. You’ve been warned! However, I’m hoping I can convince you otherwise. The brussels sprouts gratin in my kitchen is now a permanent staple on Thanksgiving. Oh yes. I love brussels sprouts roasted. I love them pan-crisped. I love them with balsamic vinegar and I love them shredded in salad. I don’t NEED them in a cheesy cream sauce. I don’t need potatoes in a cheesy cream sauce either, but that’s never stopped me. Look at this as just another fabulous way to eat this green vegetable that freaks everyone out but that really tastes GOOD. And that’s the only way I can describe it! Good. Really freaking good. Mouth-watering good. It has so much flavor that you’re actually in shock as you’re eating it. I used the base of this recipe and added mushrooms. For some reason, the thought of adding mushrooms sounded incredible to me. I knew they would add some meaty texture and make brussels gratin even more satisfying and flavorful. SO glad I was right. Honestly, you can bake the entire thing a few hours (or even the day before) and it will still taste fantastic. I personally wouldn’t go that far, since some of that crunch on the top will disappear when you do that. But! I would make everything up until the point where the brussels are in the baking dish and ready to go. You can even toss in the cheese and refrigerate it all. Before baking, whisk together your cream mixture and pour it over top. No really. This is a brussels sprouts gratin you do NOT want to miss. 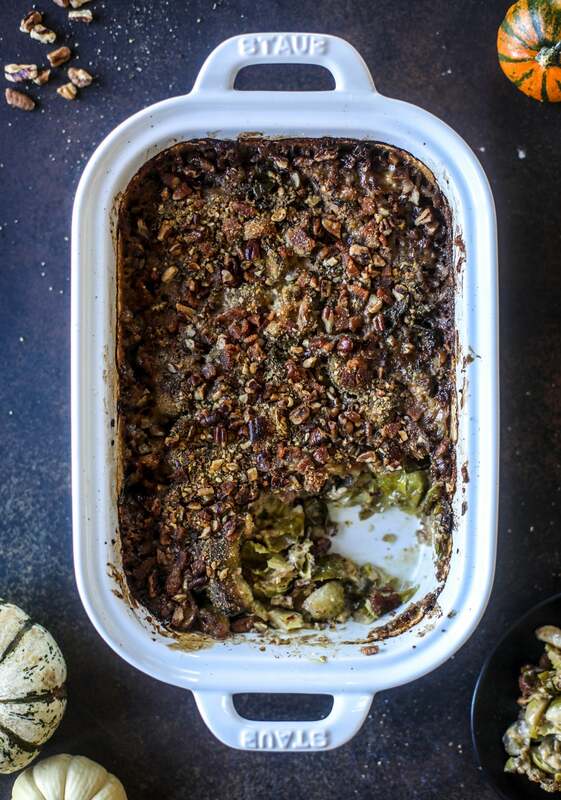 This brussels sprouts gratin is heaven in a dish! It's super flavorful, delicious and comes together to create a fabulous side dish for Thanksgiving or the holidays. Pancetta and cheese turn this in to flavor town - you won't be able to stop eating it! Heat a large skillet over medium-low heat and add the pancetta. Cook until the fat is rendered and it is mostly crispy, then remove it with a slotted spoon. Place it on a paper towel to drain excess grease. Remove half of the pancetta grease from the skillet and set it aside. Add the shallots and the brussels with a pinch of salt and pepper to the skillet and toss well, cooking until softened, about 8 to 10 minutes. Transfer the brussels to a bowl. Add the remaining pancetta fat back to the skillet. Add the mushrooms and garlic and stir, cooking until softened, about 6 to 8 minutes. Season with the thyme and a pinch of salt and pepper. Transfer the mushrooms to the bowl with the brussels. Add most of the grated gruyere and parmesan to the brussels mixture. Toss in the pancetta. Place it all in a 9x13 inch baking dish. In a large bowl or measuring cup, whisk together the cream, dijon and nutmeg. Pour the cream over the brussels and very gently toss. Sprinkle the remaining cheese on top. Bake for 20 to 25 minutes, until bubbly and golden. Remove the gratin and sprinlkle the pecans on top. Bake for another 10 minutes. Let cool slightly before serving. It’s the most flavorful ugliness ever. 2018 Holiday Gift Guide: Stocking Stuffers Under $25. As a diehard brussels sprouts fan (I know, I’m odd), this DOES look amazingly appetizing to me. Hello, perfect comfort food featuring the beautiful brussels sprouts (and cheese, of course). Not being a food blogger or photographer, I am much more likely to look at a dish like this and see how delicious it will be without giving a thought to food styling or photogenic quality!! This looks so good I’m already thinking about which of my planned veg dishes to kick off the menu this year. Thank you so much, I’m always impressed with your creativity! This is perfect for my friendsgiving this weekend! Looks AMAZING! Yum! Is “this recipe” supposed to link somewhere in “I used the base of this recipe and added mushrooms.”? yes! it’s the one linked below from bon appetit! it’s SO good. This looks amazing! I’m not a mushroom fan – could I leave those out and use more Brussels instead? Or add some green beans? Thanks in advance for any thoughts! yep! just leave them off! maybe add more bacon? hehe. This looks like a winner to me. It’s definitely in the vault! ….and will be on my holiday table. Thanks for this variation on my favorite vegetable! These were sooo good for friendsgiving and I’m going to make them again on Thanksgiving next week. I don’t think I saw where to add the pancetta back in but I added it when I mixed the mushrooms and cheese in with the brussels. !!!!!!!!!!!!!!!!!!!!!!! This recipe. Is. INSANE. I left out the pancetta and mushrooms to accommodate for my group’s eating preferences and it was STILL incredible. I added crispy shallots to the pecans for the topping. We devoured this at Friendsgiving last night, this was more popular than mashed potatoes! Everyone asked for the recipe. This is now a must make recipe for gatherings. Oh my gosh! This was SO GOOD! I love brussell sprouts but these were over the top delicious. Everyone had seconds and wanted to take them home for leftovers. This is now our new side dish for Thanksgiving. Thanks Jess! Wow! This was fantastic!! My new favorite Brussels recipe! This was the BEST! My family went nuts for this at Thanksgiving! Hi! This looks delish! Can I make this in advance to be baked right before dinner? I made this for a holiday pot luck party and they were completely cleared out. Sooooo delicious and tons of compliments. Five star recipe! Made this yesterday and it was so delicious. A perfect pairing with beef tenderloin. Is there a way to modify this into a crockpot recipe? It looks amazing, but would love to bring it to a potluck where an oven isn’t available. Delicious recipe but mine ended up very watery. Any ideas what I did wrong? I made this for Christmas dinner and it was AMAZING! Adding to the menu going forward for sure. Thanks for another winner!